Late spring, 2007. Michigan in economic freefall, state budgets being slashed, politics reduced to nastiness, state jobs being erased, and personnel furloughed without pay. Grady Service, detective for the Department of Natural Resources (DNR) in the Upper Peninsula, watches as his colleagues leave the department one by one. Upon being asked by an old friend to look into unspecified problems his son is facing on the shores of Lake Superior, Service has no idea how complicated his life is about to become. All he knows is that the situation involves something his friend calls "bleeding sand"--and that his new partner, Conservation Officer Donna "Jingo" Sedge, is the oddest young officer he's ever met. The story moves at breakneck speed as Service, nearing three decades as a Woods Cop, finds that expectations seem to be changing on all fronts, personal and professional, and he is not certain he can live up to them. Joseph Heywood is the author of The Snowfly (Lyons), Covered Waters (Lyons), The Berkut, Taxi Dancer, The Domino Conspiracy--and the eight novels comprising the Woods Cop Mystery Series. 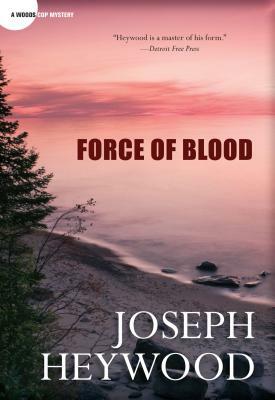 Featuring Grady Service, a detective in the Upper Peninsula for Michigan's Department of Natural Resources, this series has earned its author cult status among lovers of the outdoors, law enforcement officials, and mystery devotees. Heywood lives in Portage, Michigan. For more on Joseph Heywood and the Woods Cop Mysteries, visit the author's web site at www.josephheywood.com.